In 1989, the OTC signed its first small custodial contract at the Hughes Justice Complex. Further growing to procure government custodial contracts on the municipal, county, state, and federal level. Our custodial contracts have grown to include more than 40 locations, totally over 5 million square feet clean daily. Our contracts service various offices and facilities ranging from Camden to Trenton and serve a number of State Departments including the State Police, Air and Army National Guard, Department of Motor Vehicles, Department of Human Services, DYFS, Department of Justice, Departments of Labor, Health, and Agriculture. Through the custodial contracts, the OTC is able to provide janitorial positions and health benefit stipends to over 100 individuals with disabilities. In 1995, officials at McGuire AFB, pleased with the food services provided by OTC, awarded contracts to OTC for custodial services at McGuire’s Daycare Center and the base recycling program. OTC secured additional custodial contracts at McGuire AFB the following year. In 2006, the officials at Ft. Dix Military Installation awarded a custodial contract to OTC to clean various other facilities for the Army. Today we are cleaning over 300 buildings on base and serve the Air Force, Army, Navy, Coast Guard, and Marines. It is our honor and privilege to offer these support services for all branches of our armed forces. 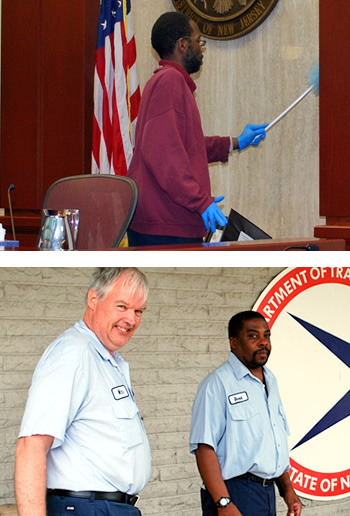 The OTC also has cleaning contract with our GSA customers, at the Federal Courthouses, in Trenton and Camden. The contracts employ over 15 people. We provide affordable and environmentally-friendly cleaning services to all of our clients and pride ourselves in our “green” approach. Thank you for considering the OTC as your service provider as well as helping to accomplish our mission of, “assisting individuals with disabilities in reaching their maximum potential.” The OTC looks forward to the possibility of providing facility maintenance and cleaning services for your business no matter how small or large the project may be.